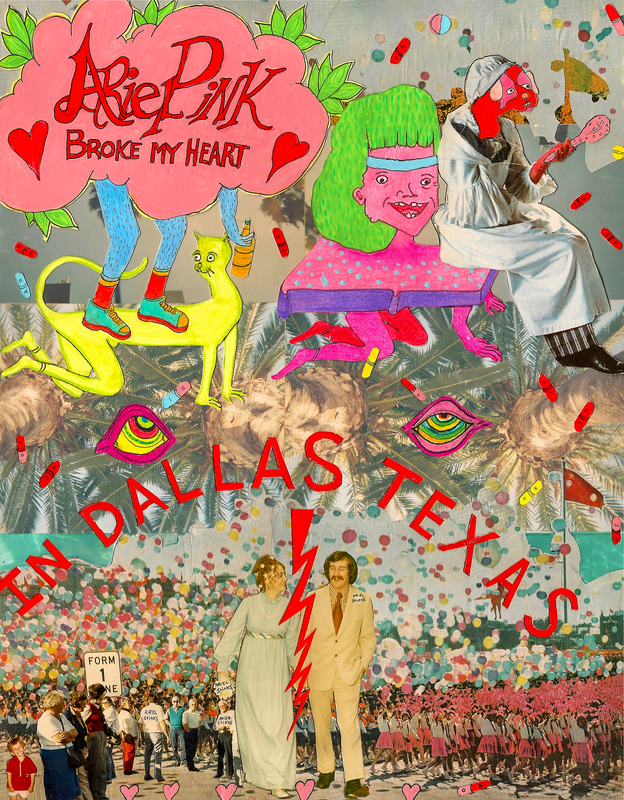 A collage illustration by the Irving-raised color fiend, ahead of Ariel Pink's Saturday show at Trees. Ariel Pink can make people uncomfortable as much as he can bliss them out. John Maus’ defense of his troll behavior seeks to exempt him from responsibility because, all points distilled, Ariel Pink is complicated and even insane. This sensibility common to hypnagogic pop and the peace-and-love aesthetics it references is one to investigate. There’s a hope, at least, to embrace dualities. I asked artist Alex Revier to illustrate a particular memory according to his relationship with Ariel Pink’s music, which he’s followed for the past ten years. Revier says the Beverly Hills provocateur is his favorite artist. The influence does come through in Revier’s work, a good-humored, sometimes maniacal amalgamation of color and era. There’s a certain ancient gravity to Revier’s paintings that I thought would make him distinct as an interpreter of Ariel Pink’s mode of nostalgic pop music. Revier is good at escape, but his work very directly expresses primal hurt — or fear — that creates the need to dissolve psychic fences. Revier responded to the prompt with this playful hieroglyphic narrative of departure. He built the collage in fewer than five days while we waited to see if Ariel Pink would respond to some last-minute email questions. (Ariel’s publicists were responsive and made it known there could be no promises.) Some cutout figures in his piece take a position on Ariel, giving the effect of a teenage disciple’s gaze, the way young fans associate heroes so closely with ideals and belief systems. Then there are the truncated hearts and lots of drugs, the presence of ’70s sepia brought to the now with bold reds overlaid. Like much of the artist’s work, it’s ultimately more about embracing an innocence that precedes social norms than the loss of innocence created by expectations of gender and sexuality. Revier makes a picture of comfort and the straight rip through it. View Alex Revier’s body of work and statement here.